It’s great that nowadays it is easier to be able to eat out whatever dietary restrictions you may have, whether it is breakfast, lunch, dinner or even afternoon tea that you fancy. 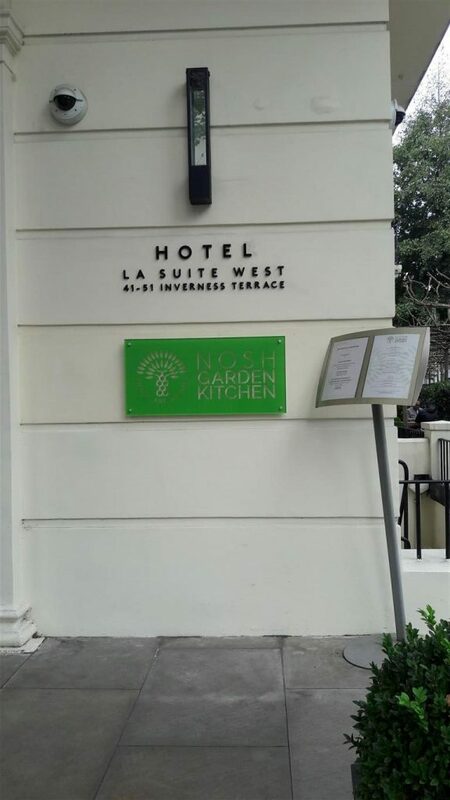 Nosh Garden Kitchen specialises in a Vegan Afternoon Tea. 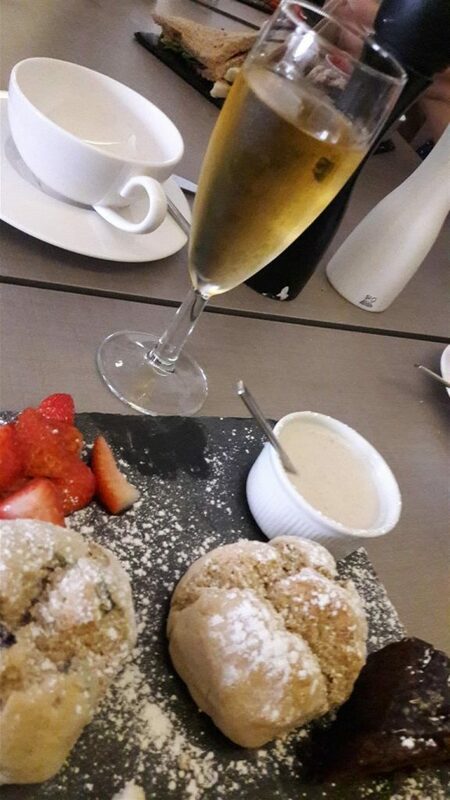 Normally, the Afternoon Tea starts with tea. But for a change, this one at Nosh Garden Kitchen started with a flute of non-alcoholic fizz. Initially we were told that the drink was fizzy grape. But later on in the afternoon, one of the staff informed us that it was grapefruit. This would not be good if you had such an allergy. After we questioned the staff again, he went and checked with the kitchen and came and told us he had got it wrong and it was actually grape in the drink. As for the tea, there was a good variety with black teas, green teas and herbal blends to choose from. 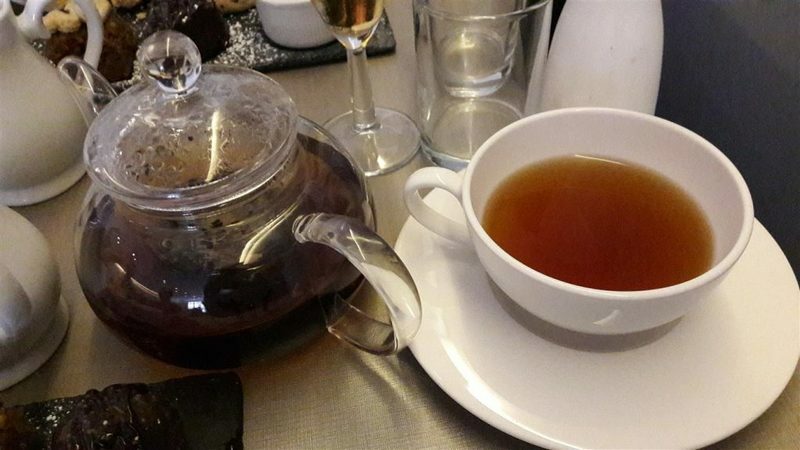 The Coquelicot Gourmand tea sounded different to the regular English Breakfast and Earl Grey. It was a loose leaf black tea with a light but good flavour. It came in a clear teapot. The milks to choose from included soya and almond. For the Afternoon Tea, the staff explained all of the items when the plates were presented to us. The staff were friendly and gave us polite and efficient service. Even though we were dining as a group, it was nice that we were all given an individual Afternoon Tea. The portion was quite big and it was laid out on a black slate. The finger sandwiches were triangle sandwiches with a mixture of white and brown bread. There was a cashew nut cream cheese filling with sundried tomato and basil, a scrambled tofu and mustard cress one and also a BBQ tempeh and rocket salad sandwich. All of the sandwiches were nice although the BBQ tempeh one had quite a strong flavour. The Nosh Garden Kitchen scones were very crumbly and had a different texture to regular scones. These ones were bursting with blueberries which made a nice change to having raisins or currants. The scones came with fresh strawberries and whipped coconut cream which was fairly sweet. There were three cakes in the chef’s selection of cakes and desserts. The chocolate brownie and the round nutty chocolate truffle ball were both rich. There was also a carrot cake with a creamy swirled topping. The savoury sandwiches were preferred compared to the scones and the cakes. 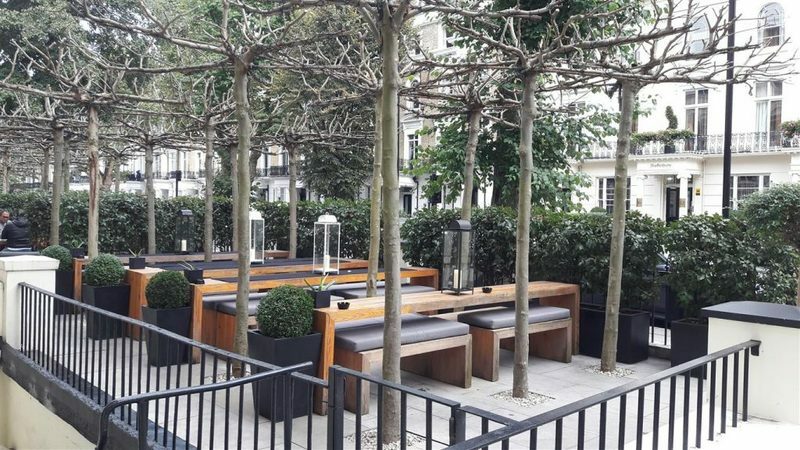 Nosh Garden Kitchen has an outdoor seating area which is enclosed by greenery. Indoors, the restaurant feels slightly dark as there is not much light coming through. 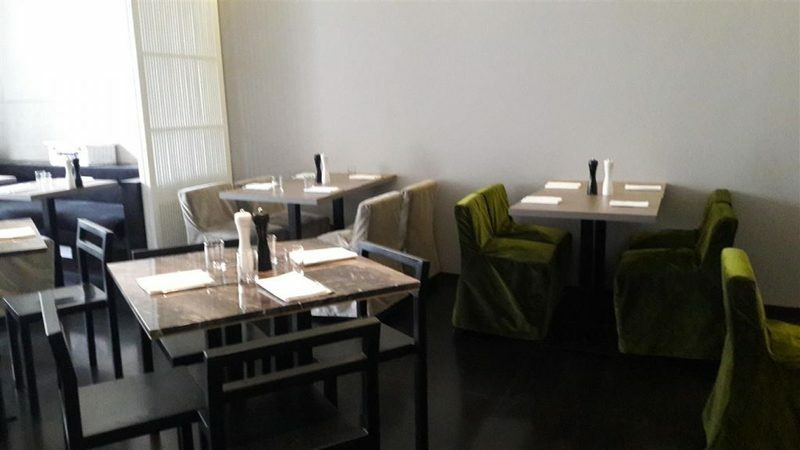 The seating is cosy and there are also smaller tables with wooden chairs. There is a simple decor with grey undertones. 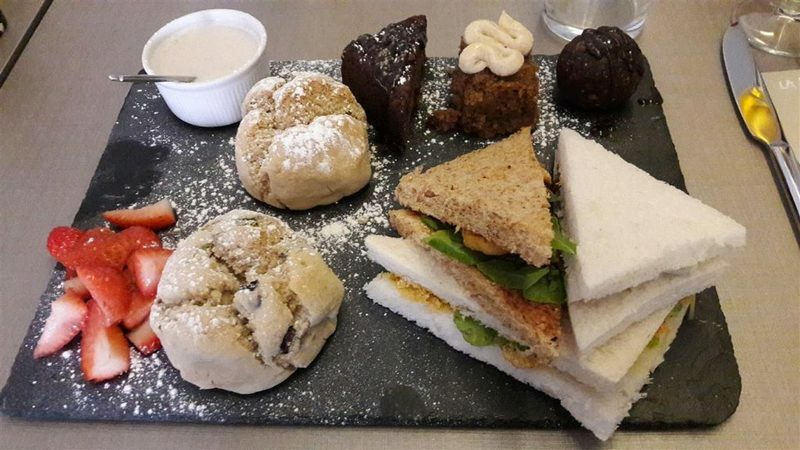 If you are looking for a Vegan Afternoon Tea, then Nosh Garden Kitchen does provide one with variety. There are subtle differences in the texture of the vegan cakes compared to regular cakes due to them being dairy free.